As explained in a number of previous posts, Mars orbited the Earth repeatedly for a total of 1,500 years in a geostationary orbit 35,000 km above Mt. Kailas in the Transhimalayas. During these encounters all of Mars’ crust, oceans, soils, atmosphere and biosphere were blasted to the Earth when alignments of the Earth-Mars pair with the Moon, and the Sun and Moon combined, occurred. The gravity of each planet on the other forced the lithosphere of the other to be reoriented. 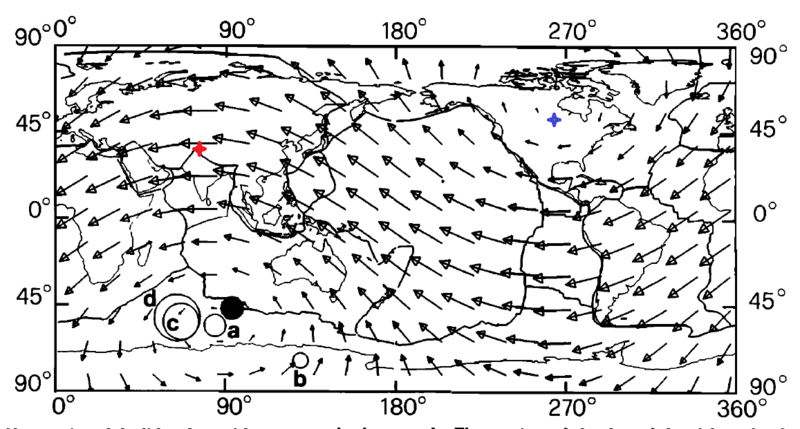 Geologists today have no idea that the entire lithosphere of a complete terrestrial planet can rotate independently from the mantle, even orthogonal to its axis, although there is a conceptual term for this, Tidal Drag. This same design, known today as dual axis spin stabilized, is used on all communications satellites. The lithosphere of the Earth rotated so that Mt. Kailas, sacred to every eastern religion, remained in the ecliptic plane where Mars orbited. Figure 1 gives modern-day evidence of this recent, unique rotation. Geologists avoid this finding, since they have no explanation. Interestingly, there were no seasonal changes anywhere on the Earth during those encounters which, based on Greenland ice cores, were mistakenly interpreted as an ice age during the entire period, from 3687 to 687 BC. Fig. 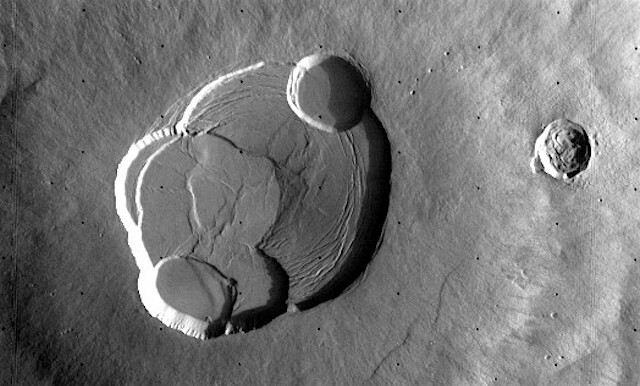 2 Caldera of Olympus Mons, where lava flows tilted toward Mars’ north pole have been measured. Due to the massive Tharsis Bulge on its equator, the lithosphere of Mars continued to rotate (conservation of angular momentum) but became oriented so that its north pole remained oriented toward the Earth during each encounter. Therefore it was described in mythologies as a rotating wheel, churn or mill (See Hamlet’s Mill). Although ample evidence of this orientation is present on Mars in the form of (a) outflow channels flowing toward the north pole; (b) Oceanus Borealis, the Northern Ocean; (c) the unique plateau at its north pole, which stands 3 km above the surrounding terrain, and (d) the fact that the entire northern third of Mars is 7 km below the datum, because during the geostationary encounters transient alignments with the Moon, particularly at eclipses, blasted rocks from hundreds of volcanoes in Mars Northern hemisphere. Now New evidence has been published in the planetary journal Icarus. The strong gravitational field of the more massive, nearby Earth significantly influenced the field at the largest volcanoes on Mars equator, oriented normal to the Earth’s field, Olympus and Ascraeus Montes. The cited paper reports that the lava in the calderas of these mountains and other features near the equator are mysteriously ’tilted’ toward Mars’ north pole. ~ by Angiras on November 5, 2018.